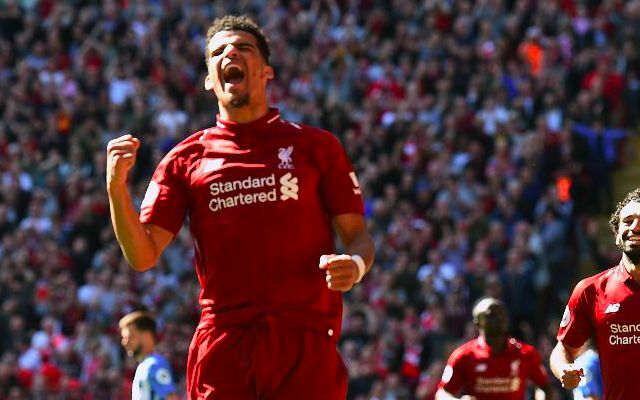 Rio Ferdinand believes Dominic Solanke must leave Liverpool in search of the regular first-team football he desperately needs. The striker has been starved of senior opportunities since signing from Chelsea in summer 2017, starting in just six of his 27 appearances across all competitions last season. It took until the final day win over Brighton for Solanke to notch his first goal under Jurgen Klopp, when he produced a fierce strike to help Liverpool towards Champions League qualification. Solanke has not yet featured for the Reds this season, nor has he even earned a place on the bench due to the club’s bolstered strength in depth. Solanke was on the scoresheet on Saturday as he played for Liverpool’s U23s in their 3-0 Premier League 2 win over Swansea City. The 21-year-old started alongside another Red facing an increasingly uncertain future on Merseyside in Divock Origi, who was also among the goals at the Kirkby Academy. A number of youth stars left on season-long loan deals in the summer in search of regular senior football, including the likes of Harry Wilson, Ben Woodburn, Marko Grujic and Ovie Ejaria. Solanke may be worth following suit in January, having attracted interest from a number of Championship clubs over August. Right now, an extended run in a starting lineup is the priority as he looks for his first period of scoring form at first-team level.